AmSafe Bridport HUSLE (Helicopter Under-Slung Load Equipment) range continues to be used by more Military Nations. Bridport, UK, January 2017. AmSafe Bridport has provided HUSLE to the UK MoD and other Military Nations for many years. Focused on flexibility, their HUSLE range is designed to the NATO STANAG’s 2286 and 3542, facilitating its use in accordance with the UK MoD published and approved the list of ‘lifting schemes’. 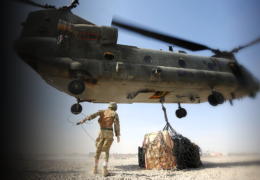 This enables the customer to uphold the NATO STANAG 2445 agreement which details their responsibility to abide by the ‘Criteria for the clearance of helicopter underslung load equipment (HUSLE) and underslung loads (USL)’. •	Spares with the likes of; Hook & Swivel, Masterlink, Coupling, Roundsling, and so on. AmSafe Bridport has seen new Military Nations adopt the use of HUSLE for the likes of lifting; artillery guns, land vehicles, humanitarian aid, general supplies, helicopters, specialist equipment, ship spares, etc. “HUSLE is a key capability for the Military. We have seen a growing number of military organisations adopt the use of our HUSLE, it is vital the equipment is; safe, reliable, aftermarket supported and complying with known ‘standards’ for airworthiness. We are pleased to support both the new Nations and those existing users who rely on AmSafe Bridport HUSLE for their varied operational needs.” – said Joe Ashton, Cargo Business Unit Manager for AmSafe Bridport.